Specimen collection numbers SCL 15362 and SCL 15257 in the UBC Herbarium Algae Database. Search the collection number in the database for more information on this specimen, or search the species for further occurrences. Images courtesy of Sandra Lindstrom. 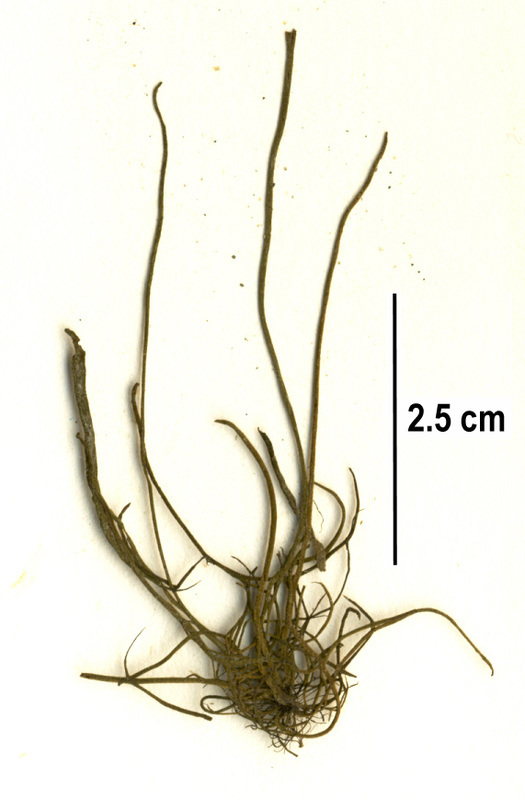 This brown seaweed somewhat resembles a clump of dead, waterlogged grass: a cluster of unbranched, partially hollow tubes (thalli) grow from a disc-shaped holdfast. These tubes are often twisted. This species ranges from light brown to dark brown, and usually has a reddish tinge. It grows to 35 cm tall. Click here for more images. ​Twisted sea tubes is a weedy species that often forms mats. It grows on rock in the mid to low intertidal, as well in tidepools, along shorelines protected from direct wave action. It is an annual seaweed that colonizes bare rock early, growing in late winter and early spring. Its range in the eastern North Pacific extends from the Bering Sea and Aleutian Islands south to central California. It is also found along the coasts of Korea and Japan, and in the North Atlantic. Soda straws (Scytosiphon lomentaria) tubes are regularly constricted along their length, in the style of sausage links. They also are not twisted, and tend to be lighter in colour. Soda straws and twisted sea tubes are often found growing together, along with false kelp (Petalonia fascia). Lindberg, M. and Lindstrom, S. (2010). Melanosiphon intestinalis Twisted Sea Tubes. Seaweeds of Alaska. Accessed 12/04/2016. O'Clair, R. and Lindstrom, S. Melanosiphon intestinalis (Saunders) Wynne. In Klinkenberg, Brian. (Ed.). E-Flora BC: Electronic Atlas of the Plants of British Columbia. Lab for Advanced Spatial Analysis, Department of Geography, University of British Columbia, Vancouver. Accessed 12/04/2015.